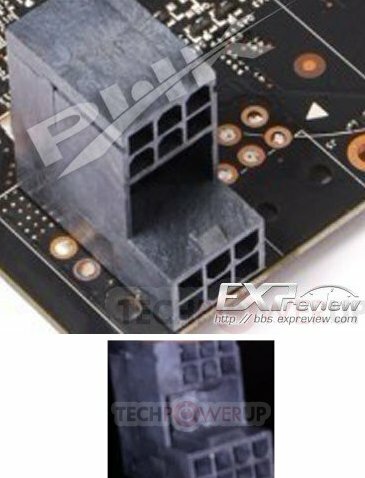 TechPowerUp noticed that leaked photos of an engineering sample of NVIDIA's GK104 reveal the card has an unusual power design. The photos reveal the board has five NVVDD phases, and up to three miscellaneous power domains. Strangely, it has provisions for two 6-pin and one 8-pin connector, and there's a awkward new plug that has two 6-pin (or 8-pin plus 6-pin) stacked. The funny part here is a strange new plug that has two 6-pin (or 8-pin+6-pin) stacked, while one of the two 6-pin connector leads are blanked. Some of our sources also report having seen a similar connector with 8-pin and 6-pin on samples of this card (refer to the last picture below). It's not just this, that makes the card incapable of single-slot operation, the DVI connectors over at the display IO also are stacked like on previous-generation AMD Radeon cards. Other connectors on the card are HDMI and DisplayPort. There are two SLI bridge connectors, giving it 3-way and 4-way SLI support.